This half term our topic is all about the sea and the seaside. We plan to have lots of fun with it, even though we are about as far from the coast as it is possible to be! Our huge sandpit will get lots of use, and we are planning a visit to Cassiobury water park to play in the paddling pools. We will find out lots about marine life, and think about what we need for a seaside holiday, and what we would see and do. Our book for the next couple of weeks is The Lighthouse Keeper's Lunch, and in art we are making an enormous lighthouse and the lighthouse keeper's house. A flock of seagulls will surround it, and we're planning a line from the house to the lighthouse so that we can send a basket down it, just as Mrs Grinling did. We would love to see any photos you might have, if you've been lucky enough to have a family visit to the seaside. We were very pleased to welcome the children back after Easter, and the nice weather has really got us in the mood for the summer term's activities. Our topic this term is 'To Market, To Market'. We will be finding out about fruit and vegetables and growing them in the garden. We will also go shopping for them in a variety of places, from the supermarket to a farm shop. We'll be preparing the produce in lots of different ways in cookery, and finding out which countries some of it comes from. Our recipes will also come from different parts of the world. We are planning to do lots of coin handling and money work in maths, and will have our own class shop for role play. For the next few weeks, we will be working with the children on them being able to tell us their address. Those who are writing will also learn to write it down. It would be really helpful of you could let your child practise saying their address at home. Maybe you could even ask relatives and friends to ask your child his/her address, so they get used to telling it to other people. This is a really important skill for them to have as they get older, or in an emergency. It would also help if you ask them in different ways, such as "What is your address?" "Where do you live?" "Where is your house? ", so that the children can answer however the question is worded. Our first story this term is The Shopping Basket, by John Burningham. The children are learning to make shopping lists based on this story, and we are also talking about bullying, using the actions of the rather mean animals in the story as the stimulus. Our story at the moment is Handa's Surprise. Handa lives in a village in Kenya and she gathers together a lovely basket of fruit for her friend. But some cheeky animals help themselves to the fruits as she walks to her friend's village. We bought the fruits in the story, and yesterday we tasted each of them. The children told us which ones they liked and which ones they didn't. The mango was the most popular, while the passion fruit was the least liked. We are going to make a tropical fruit salad with the remaining fruit. We are very proud of the shopping bags that the children have painted with fabric paint. We looked at cross sections of various fruits and vegetables. The children drew what they could see, and then painted the same design on to their cotton bags. Sarah then ironed the design on so that the bags will last, and even be able to be washed. You will be able to buy your child's bag if you wish, for just £1. Remaining bags will be sold at our open afternoon on the 30th May. Our topic for this half term is The Wheels on the Bus. We will be finding out all about different forms of transport, and taking a couple of trips to experience some of them. We will be doing a traffic survey in maths, and finding ways to express the data that we end up with. In science we will explore pushing and pulling - including a trip to the park where we will find out how we make different items of play equipment move.. In English, our first story for this half term will be Mr Gumpy's Motor Car. Our programme of transport related trips culminated in a visit to the airport. The children were really excited and very observant and focused. They watched intently as planes took off and landed, and we heard lots of lovely spontaneous speech and observations from them. As always, they were beautifully behaved, and even had the armed security men charmed by their enthusiasm! They were rewarded with a drink and a biscuit in the airport cafe. As part of our transport topic, we went on a fantastic train trip. We caught the train at Luton Parkway, and travelled to Flitwick and back. The children were very excited, and beautifully behaved. We were very proud of them. While we were in Flitwick, we visited the play park to explore pushing and pulling, which is our science topic for this half term. Science has rarely been so much fun! The children loved the 'Going on a Bear Hunt' story, and all were able to re-tell it, many knowing it off by heart! Our exploration of the book culminated in an amazing trip to the e-learning centre, where the children created their own background music, acted the story out in the TV studio, and animated their own bear to make it talk. A really exciting day was had by all. There has been lots of progress made during the half term, and we were really proud of everyone. We particularly reflected on how far the children have progressed in swimming since September. Sadly our swimming sessions for this year have come to an end, but it has been good to see so many children able to cast off their armbands and begin to swim independently. Well done to all. A warm welcome back to our pupils and parents. 2015 has got off to a flying start in Green class. At Christmas we said a sad goodbye to Emily, who has moved to Sapphire class, and now we welcome two new children, Tanatswa and Reyu. They have both settled in very happily and have made new friends already. In English we are reading Mr Magnolia, by Quentin Blake. His books always go down very well with the children, with their humour and rhyming language, and his quirky drawings. As those of you who have read the story will know, poor Mr Magnolia has only one boot, so the children will be designing him another one, and making it in their art lessons. Our maths work at the moment is on non-standard measure. We are going to be measuring items around school using our foot lengths. We have already made footprints with paint (yes, that was a messy lesson!) which we will cut out and use to measure things - as well as measuring items on the floor by walking 'heel to toe'. Our 'Under Our Feet' topic has started with us looking at different types of shoes. We decided who would wear which, and what type we would wear in different weathers, and different places. We've also been matching pairs of shoes. We also had fun trying on lots of different shoes! Watch out for photos which will be put up here in a few days. As part of our 'Under Our Feet' topic, we have been finding out about different types of footwear. This week was 'Welly week' and in science, we tested our wellies to see if they were waterproof. The children had a lovely time puddle jumping, and fortunately, we discovered that everyone's wellies had kept their feet dry! We had found out already that a plimsoll would let the water in, so the children learned why they wear wellies in wet weather. Our book this week is The Foot Book, by Dr Seuss. The children are really enjoying this simple rhyming book, and joining in with me, or re-telling it to their friends. We've also watched this YouTube version. For the next couple of weeks, we will be basing our English lessons on Michael Rosen's 'We're Going on a Bear Hunt'. It's hugely popular with our children (some of whom will be re-visiting the story) as it involves lots of sensory experiences, emotional responses, and has a lovely rhythmic feel to it. We're going to visit the e learning centre, where the staff will help us use their equipment to make a video or other representation of the story. This will be the first time we've visited the centre, so we are very excited about it! In maths, we are working on coin recognition and using money - sorting, matching, and recognising values. Some of the children will work on combining coins to make a value such as 25p and £1.50. We will do lots of shopping role play to keep our learning practical and fun! If you are able to extend your children's experience of using or sorting coins at home, or letting them pay small sums to the assistant when you're out shopping, that would be great. We are having a really lovely time with out Barnaby Bear topic. We have taken him for walks, played hide and seek with him in the classroom, and painted his picture. We got a shock the other day though. We went to the classroom and Barnaby had disappeared! We looked everywhere, but it seemed he had escaped and gone exploring. Luckily, we found he had left a trail of pawprints, so we all looked around carefully to find them and follow the trail. We eventually found him in Jill's office! It's been a really busy half term - and lots of fun! The children really enjoyed our Barnaby bear topic, and we've had lots of outings, both near and far, to take him to see different places. We haven't been able to find him for the last few days. Imagine our surprise when we got a postcard from him today, all the way from California! He certainly didn't get there on our school minibus! We are thrilled with the progress that all your children have made this half term. Thank you very much for your support and for working with us to provide the very best learning opportunities for them. Have a wonderful Christmas. It will be no time at all before we're back, and having lots of new experiences as we explore our new topic 'Under Our Feet'. Hello, and welcome to Green Class. We have had a great start to the term, welcoming back David, Rosie, Naomi and Lawrence, who were joined by new classmates, Emily, Daniel, Cais and Olly. Everyone settled in beautifully. My name is Sarah, and Gemma is my lead teaching assistant. We are ably supported by Anne, Lianne and Madi. We all work together to offer your children the best learning opportunities that we can, and to be a warm and caring 'second family' for your child. We very much look forward to working with you. Our topic this half term is 'What People Do'. We will be finding out about the people who help us. This will involve lots of role play, and hopefully some visits to meet some of the people we rely on. In Science we are finding out about sounds, and going out into our community to listen to the sounds around us. Our cookery theme this half term is biscuits, and in ICT we will be exploring switched toys, the Soundbeam equipment, and the light sensory room. We will be swimming on Fridays, and PE is on Wednesdays. Do visit our page regularly - for our latest class news, to share the stories we are reading, and to celebrate progress with us. And remember to give the link to you relatives and friends - especially those far away, who I'm sure will love to see the photos of your child at work and at play. Green class are enjoying their new story, The Tiger Who Came to Tea. We have been learning all about the sound 't', and some of us have been learning to read the question words 'who' 'when' 'what' and 'where'. At the end of next week we will have a tea party with a special visitor. In maths this week we are working on matching, sorting and patterns. The children have been very good at matching and sorting items by criteria such as colour and shape. Next we are going to get them to make, and continue some patterns on a pegboard. They will also use the computers to drag and drop items to copy a given pattern and then create their own. The children have enjoyed using our new Soundbeam equipment. Sounds are programmed into the system and activated by a range of switches. We can programme in sounds to go with our topic or a story, and we can play them alongside pre-recorded music. It's really good fun! The children enjoyed working with Achlan to make their own sound combinations. This week we have been finding out about people who help us when we are ill. We had a lovely afternoon role playing at being doctors and patients. The children were surprisingly good at bandaging, so I think we have some budding first aiders! They were so focused and involved in what they were doing. It was a really lovely session. We had a great trip to Stopsley fire station. We sat in the fire engine (and set off the sirens), used the powerful water hoses, and even got to watch TV in the fire officers' lounge while we waited for the minibus to take us back to school! The first half term of this school year has gone by so quickly! The children have made a great start, and already we're seeing some outstanding progress in Green Class. Our 'What People Do' topic has been really stimulating for the children. They've shown lots of imagination in role play, and our visits to the fire station and the hairdressers have been great fun, as well as really good learning experiences. The visit from the policeman and his van (complete with 'cell' at the back), gave us an opportunity to make lots of sound (which was our science topic) with the sirens. I hope our neighbours didn't mind too much! It was really good to meet many parents at our 'meet the teacher' coffee morning, and at my presentation about fine motor control and co-ordination. I know that many of you really want to contribute to your child's learning at home, and I will be working on more and more ways to help you be involved. 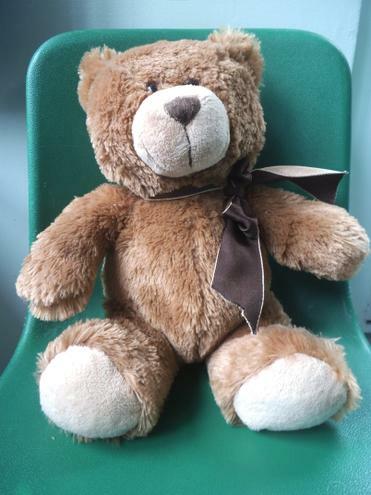 Next half term, our topic is 'Where is Barnaby Bear?'. It's another topic that we have lots of fun with. We'll be taking Barnaby to lots of special places, and learning about other parts of the world as well as our own locality.